To eat, dip a section of rolled noodle goodness into the accompanying warm fish sauce broth, brightened with a squeeze of fresh lime. If you wanna travel to Hanoi but don’t know anythings about Hanoi Vietnam travel, you can look at in this topic. Among other members of the extended noodle family, bánh cuốn almost ranks first. It is a paper-thin steamed rice flour pancake, much like delicate sheets of fresh rice noodles. 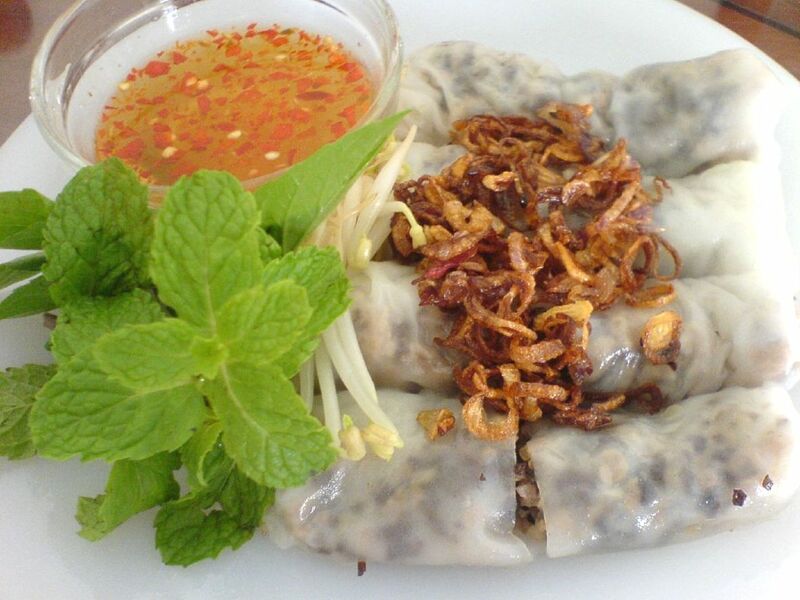 The pancakes are plucked off of the linen steamer base, and immediately rolled with minced pork and mushrooms, then piled on a plate, sprinkled with deep fried shallots, snipped with scissors into bite sized sections, and topped with fresh herbs such as cilantro or Vietnamese basil. A plate of bánh cuốn is a light dish traditionally eaten as breakfast in Hanoi Vietnam but now can also be found as a late night snack.